Our mission is to support legislative and charitable initiatives at the local, state, and national levels to enhance our families, communities and country. 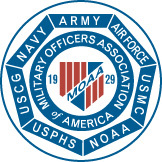 Capitol Area Chapter of the MOAA has established a separate, tax-exempt scholarship fund to award college scholarships and book allowances to children/(stepchildren) and grandchildren/(step grandchildren) of Chapter members or children of Michigan active duty military service members killed or disabled in the line of duty. The goal of the scholarship fund is to provide as many $1,200 scholarship grants or $250 book allowances as possible annually to qualified applicants. We need help in funding and sustaining the scholarship program. Please join us in helping a deserving child achieve his or her dream of a college education by sending a donation to the address on the Donation Form on the Scholarship page. If you are a current, former or retired commissioned officer of one of the services represented by the emblems below your are eligible to join our chapter.